"Hey Tony, I wanted to let you know as well as your company that you..."
"Hey Tony, I wanted to let you know as well as your company that you were absolutely wonderful to work with. You made what could be a very stressful process of trying to find an apartment both smooth and even enjoyable. Thank you so much for your help- if I ever know anyone looking to buy or rent I will be sure to send them your way! Thanks again "
"I just wanted to take some time and thank you for your help in renting..."
"I just wanted to take some time and thank you for your help in renting my new apartment in Fleetwood. You were so accommodating and completely took the stress out of the process. You made me feel comfortable throughout the process and I am so happy I ended up working with you. Not only did you show us a beautiful apartment, you also took the time to tell us about the area and places we''d like to go. Megan, Samantha, and I love our new apartment and we are so grateful to you for that. If we ever need help finding another apartment in the future we now know who to call. Please forward this note onto your management as I would like them to know what a great experience it was working with you. Thanks again, Amy Thomas "
"My husband and I were looking to get out of the city with our toddler...."
"My husband and I were looking to get out of the city with our toddler. From the first moment i talked to Tony on the phone i had a good feeling. He was kind, thoughtful and knowledgeable. Throughout the whole process Tony helped us at every step, there wasn''t one time that i called that he didn''t answer. He went above and beyond his scope of duties to help us. This was our first pleasant apartment hunting experience in our lives! Tony got us a beautiful apartment and the approval process was quick and smooth. thank you so much, we moved in and are so happy. We would recommend Tony to anyone looking for an apartment. " 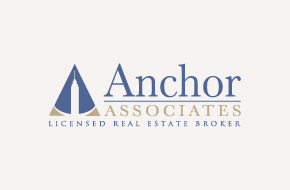 "Hi Val, Just wanted to let you know what a pleasure it was working wi..."
"Hi Val, Just wanted to let you know what a pleasure it was working with Mr. Tony Segno at Anchor Realty. I must tell you I have never worked with someone who was so accommodating and professional! He is a real asset to your company and I will be more than happy to refer anyone who is looking to purchase a home or rent one to Mr. Segno. I am sure they will be as pleased as I was dealing with someone as professional and who has a keen eye for detail. He was extremely helpful to me and my husband and made us feel so comfortable in finding just what we needed! Sincerely, Mrs. Daniel Collins "
"I would like to express my sincere appreciation for the exceptional he..."
"I would like to express my sincere appreciation for the exceptional help that I received from your company! A very special thanks to Tony Segna! Not only did Tony make the task of looking for a new place to live simple, but he somehow managed to make the process fun and effortless for me. Throughout the search, very close attention was paid to my concerns and needs. Because of this, very little time was wasted and Tony and I were able to find a new place for me to live within a couple of weeks. What a relief !! There are not many times in life that you run into a true professional in their industry, however I must say that this is absolutely one of those times. Tony - Thank you again for the great job! I can’t express my appreciation enough! Most Sincerely, David Frattaroli "
In June 2006 Tony joined our Anchor Associates New Rochelle office as assistant manager, bringing over 25 years of business and customer service experience to the company. Tony owned and operated a convenience store for 22 years in Mount Vernon. His warm and engaging personality as well as his professionalism and enthusiastic approach to the real estate industry make him an integral part of our team. Tony is self-motivated and dedicated to fulfilling his clients’ needs and expectations. One Bed Room Co-op For Sale Motivated Seller !! 1 BR - Mount Vernon - Gated Community - Health Club and More!